Why is Judge Ramos pushing a Wachovia-Citigroup marriage? 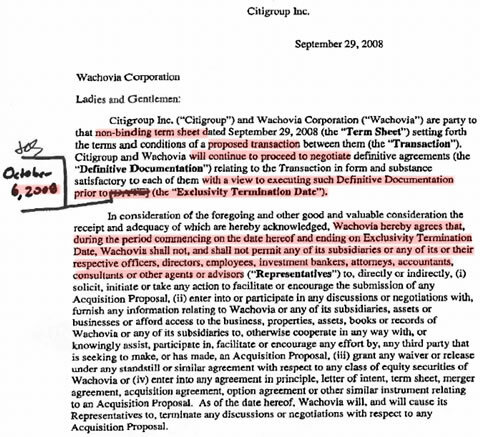 Citigroup’s “agreement” with Wachovia appears to be a bust. If the $2.1 billion deal is documented by nothing more than the letter posted at Clusterstock (key excerpt below), Citigroup shareholders should get set for disappointment: the “non-binding” term sheet apparently involved a $42 billion contribution by the federal government. Citi’s reported $60 billion lawsuit against Wells Fargo suggests Wachovia was worth far more than Citi was letting on. Great news just in from Wachovia: It’s “fair value” rose by an astonishing 750 percent overnight, to $15.1 billion from $2.16 billion. That’s right. Yesterday at this time, Wachovia was supposedly worth only $2.16 billion — in the eyes of government regulators who were trying to force it into an arranged marriage with Citigroup. Turns out that the regulators were wrong. The market had other ideas. Congress take note: regulators can get it wrong on both ends — high and low. Lucky for Wachovia’s shareholders — and the financial markets — Wachovia’s board didn’t listen. Best to let the market do its work and get out of the way. Speaking of which, what about U.S. GAAP’s “fair value” accounting regime? How much was Wachovia really worth 24 hours ago? Either U.S. GAAP was lying then or it’s lying now. What’s the point of having companies report assets at “fair value” when fair value is so context-dependent and fluctuates by 750% in a matter of hours? Fair value makes sense in some contexts, particularly in highly liquid markets. In others, it is likely to be materially misleading.